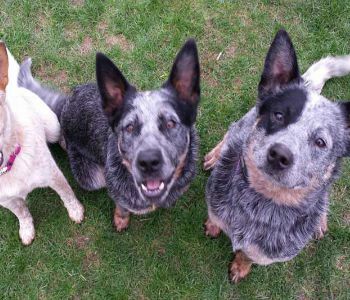 Australian Cattle Dogs have always found themselves in shelters, as many people do not do proper research on the breed before acquiring an ACD. The need to have a network for them in Ohio is great. While Ohio Cattle Dog Rescue Team may be a newly formed group (mid 2014), this team has many combined years working together in rescue. The Founders of OCDRT have been active in ACD Rescue since 2003, along with backgrounds in the veterinary fields, animal control fields, business ownership fields, military fields; all have been through the adoption process with other Rescues. OCDRT takes in ACDs primarily from shelters. Owner surrenders are considered on a case by case basis if we have room. If you want to surrender your ACD, please contact us; maybe we can assist you with keeping your ACD in its own home first. After OCDRT takes in an ACD, OCDRT then completes all the vetting, does evaluations, does necessary training and when the ACD is ready, offers them for adoption to approved homes. ACDs who find themselves in the shelter may be there for any number of reasons and most often it is through no fault of their own. This breed is not for everyone; they are very cute as puppies, but when they start to herd / mouth / bark / ignore their person to do what pleases them (sometimes they are simply deaf), many people become overwhelmed and give the puppy away or surrender them to a shelter. These behaviors are all normal ACD behaviors; however, most people do not want to deal with the intelligence that comes along with this sometimes stubborn breed that will take over a home if allowed. Our fosters are normally older pups or young adults. We are often asked if the adult will bond with its new family and our answer is always ‘YES!’ This breed is very loyal and will typically pick one person in the family to shadow, but will interact with all in the family. When you adopt an adult, you skip all the ‘unknowns’ that come with a puppy. The adult’s size, color, looks and temperament are known; a puppy is a blank slate. Breeding and how the pup is raised/socialized will determine what kind of adult that puppy will become. If you still think you want a puppy, please know we do not adopt our puppies out until they are 16 weeks of age so we can have them altered / vaccinated and start a very strong foundation in socialization and training. ACDs need tremendous amounts of each and they will test you nearly every day. We are a 501(c)3 and all donations are tax deductible! Donations go toward helping with OCDRT’s food and / or vet expenses.